The 8th Shadow-tracking Expedition had four observing places. The first one was in Gabon, the second in Uganda and the third and fourth ones were in Kenya. 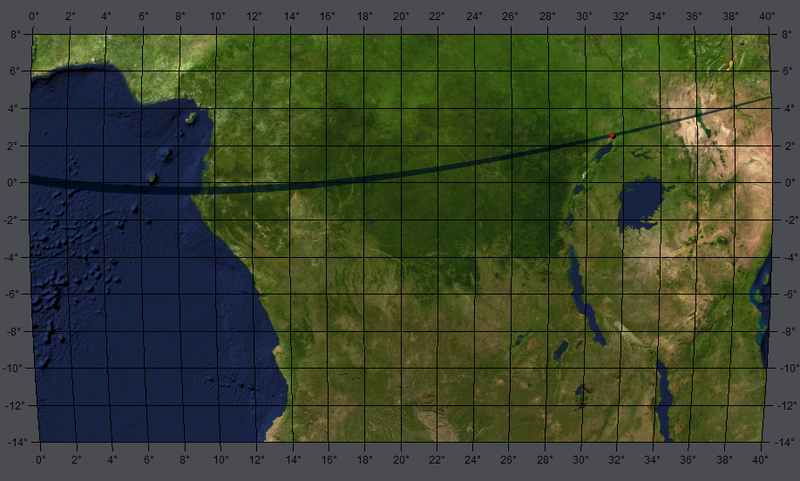 The observing place in Uganda was in Pokwero (N 2° 33' 21.24", E 31° 23' 59.10", Alt. 640 m), where the eclipse was observed by Petr Horálek and Jan Sládeček from the Czech Republic. The very short totality, only 19 s, was the main problem of this observing place. That is why the precise planning was necessary. Three different cameras were used for the same purpose - to obtain high quality image of corona. The images used for the innermost corona were taken by means of Rubinar 10/1000mm and Canon EOS 6D. The images for the middle and outer corona were taken by the pair of 5M-5CA 8/500mm (Maksutov-Cassegrain) lenses and Canon EOS 350D cameras. The weather before the eclipse was not very optimistic but just before the totality the sky near the Sun nearly perfectly cleared. Only high very thin clouds interfered the observing. The influence of these high clouds on the final image of solar corona is nearly negligible.